We’re writing this short guide in response to a question from one of our members. Here in the UK, amateurs are required to validate their licence every five years, so that Ofcom knows you’re still active and the details on file are correct and current. If you hold a licence, see our guide to validating your UK amateur radio licence. So what happens if you’ve let your licence lapse, or have taken a break from the hobby and are looking to return to amateur radio? If your licence is no longer valid or has expired, you can’t use Ofcom’s online validation process to re-activate your licence and callsign. Instead, you have to complete an application form and post it to Ofcom to get your licence back. There’s no longer a fee for an amateur radio licence in the UK (It used to be £15 a year) – However note that to reapply for a licence that has lapsed, there’s a one-off admin fee of £20 when applying with a paper form. Need us to check for your entry in the callsign book? 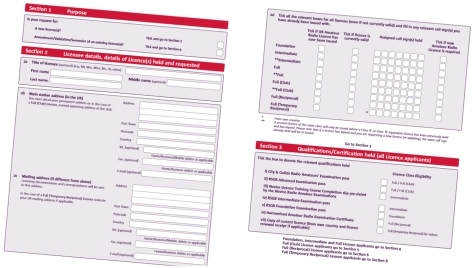 At the time of writing (May 2014), the form you need to complete is an 11-page PDF multi-purpose form that’s used to get a new licence, apply for a club callsign, update a licence, or surrender a licence – therefore not all sections apply. The form states that you should allow 14 days for processing once it’s been sent in. Payment: A fee of £20 applies. This can be paid by enclosing a cheque with the form, or by adding card payment details in Section 12 of the form. Visa, Mastercard, Switch/UK Maestro and Visa Debit/Delta card payments are accepted. BACS transfer, postal orders, Visa Electron / Solo cards, and cash payments are not acceptable. What’s changed in amateur radio? Great idea putting this on line, something has to be done about our dwindling numbers. It is possible to get replacement C&G certificates, but it takes 5 weeks and costs £44. Maybe the RSGB could offer a callbook reference service, not everyone lapsed has kept callbooks. Not appicable to me however – kept current for over 50 years. Just filled the form in, and double checked with Ofcom about the fee. At first they didn’t even know this form could be used for reinstating your amateur radio license ! My lapsed callsign was G4HPB, any idea where I could enquire to obtain a copy of the RSGB call book around 1977 to 1980. Richard – did you manage to find a RSGB call book ? I was licensed as G8MHL at that time, and wish to get my license reinstated after many years. Like yourself I don’t have a call book with my details listed..
Did you resolve the renewal Pete I am G8 XMP I want to renew my license..
Hi – I have just seen your post (see my reply to Richard above). You are listed in the 1985 callbook also but as “Particulars withheld at licensee’s request” so I don’t know whether they would accept that, but I can send you a scan of it if you like. Hi Richard – just seen your post – I have a 1985 callbook with your callsign listed if that is any use. I can scan and send you an image of the page if that helps. I (thought) that I had been continuously licensed for 47 years (G8EFU) but have just fallen foul of the crazy Ofcom “renew every 5 years” system. If you forget to re-validate then they simply cancel your licence without any communication whatsoever – crazy. Would you be kind enough and look up my call please.. Its G6ZVR. I found your site and this very well written process after digging about on the Ofcom site for a while and ending up non the wiser regarding how to reinstate my license. Full address with post code. Full card details including the card verification number. Ofcom need to get with the program and figure out a better way to carry out this process. No details of who looks at these forms. No details of if they are kept filed securely or destroyed. No guarantee what will happen to your details. If you ask the Bank/CC company to cover a fraud they will ask a standard question about if you shared your details with anybody and if you have then they are within their rights not to cover any fraud resulting. Andrew – I have just been through this today (5th September 2017) and at first I ran into the same issue. I went to register on the Ofcom site (not the best laid out site ever!) and it sent me an email with a link it in to set a password. I did this on my mobile phone and when I got the email there was the link but I couldn’t click on it. I copied and pasted it into a web browser on my phone but this didn’t work it went straight to a login screen for people who were already registered. In the end I had to open the email on a computer and the link then became ‘clickable’ and I was able to set a password. It seems being registered is the only way to get to the licence application form. Like yourself I have been off air for many moons, nearly 25 years, so I’m trying to get my old call sign back. Hope this helps and best wishes. I am attempting to reinstate my licence after a gap of over 20 years. The problem is that i cannot find any of my original paperwork. I don’t know anyone with historic call books either, though my call is listed on QRZ/Hamcall etc. Consequently, i’m at a bit of an impasse. RSGB were very helpful in finding my old callsign, GW8PJE, which expired in 1983, when I left the UK. Just email details to ar.dept@rsgb.org.uk. Returned copy of relevant callbook entry following day, with offer of 3 month free trial subscription to RSGB. I have been living overseas for past 20 years trying to re activate my old G8 callsign but am finding the OfW346 form difficult to understand as to which parts I need to fill out if living permanently overseas. Does anyone have an example or advice on this please? RSGB were great with giving me an old call book page showing my callsign from 1985. But the OfW346 has me stumped. If in doubt, just drop Ofcom an email or give them a call – from my experience, they’re very approachable. My licence lapsed sometime in the late 80s and I had no original physical copy When I wanted to come back into amateur radio last year, RSGB were extremely helpful in sending me a copy of the callbook entry. Armed with that, the RAE cert (which I’d fortunately hung on to), and 20 quid, I was able to get a licence with my original callsign from Ofcom. By the way, Ofcom’s site is a little complex. You need to register yourself as a user first. Once you’ve sent them the forms, evidence of callsign/exam pass and payment, you’ll get a response in a week or two. They then link your licence to your website user. I was looking at the process for an old radio amateur mate, I also found Ofcom’s site a bit of a maze! I have forwarded him this page link. Oh and his callsign G8RAE! Hi there, I have a problem concening Licence Reinstating. If anyone out there can help I would be greatful. I was licenced in the late 1980’s, but not since. My problem is that I now live abroad, and in order to ‘convert’ my old UK licence l need to have a ‘current UK’ licence. In order to get a UK licence (which I know that can be done in UK) I need a UK address, which I don’t have. So, how do I get a current UK licence – without a current UK address? The country I’m in (Vietnam) will NOT accept C&G certificates or outdated 1989 UK licences. Looking to have a look at Amatuer radio again after many years qrt. I think I still have my certificates somewhere and an old RSGB renewal notice. I used to be G0JPT but think I was one of the withhelds in the old callsign books. Hopefully theres still some action on the bands around me.